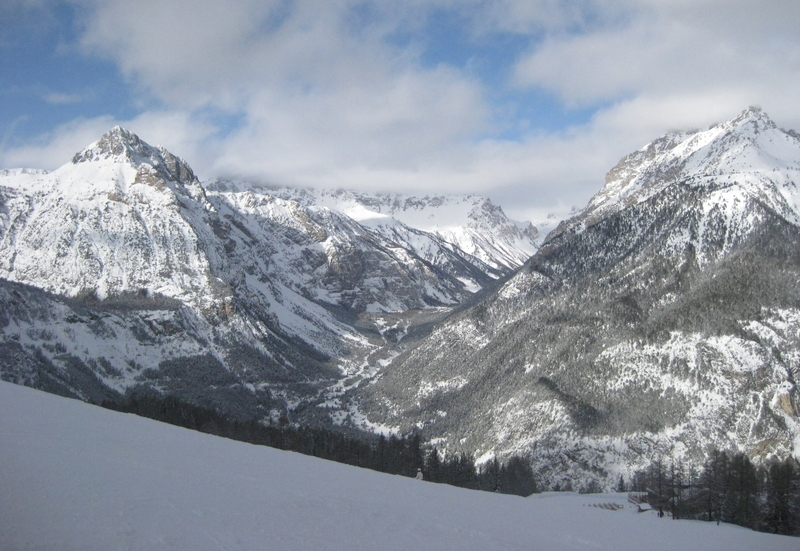 Want to know where to ski or board this winter? Here’s my tried and tested guide to finding the most underrated, but brilliant, ski resorts in Europe. Growing up, I was enthralled by the charmingly British ‘Ski Sunday’ (how many of you have now go the theme song stuck in your head?) that was compulsory TV-viewing in my family. I couldn’t wait to one day venture onto the pistes myself. As soon as I hit my twenties I made it my aim to learn to ski, and discovered a whole new world of new travel experiences. The most difficult thing about skiing however, other than the hangovers and the tired legs, is choosing where to go. Europe boasts an incredible variety of ski areas, from delightfully cosy alpine villages to packed, crowd-pleasing purpose-built resorts. Not only do they offer the opportunity to explore a beautiful winter wonderland, they’re playgrounds for skiers and boarders looking to have more than a little fun. So to help you choose what’s best for you, here’s some of my favourite picks for this winter. They’re tried and tested, and a little off the beaten path to help you find great value for money and empty pistes. Nope, we’d not heard of it either. But this French resort perched just above the city of Grenoble deserves more attention than it gets. The town is split into two parts, a skiable distance apart. Chamrousse 1600 is the older vof the two villages, and home to some quintessentially French cafes and restaurants. Chamrousse 1750 is the resort centre and home to pretty, low rise apartment blocks centred around a sports centre that offers free access to the snow-rimmed outdoor pool, saunas and hot tubs to lift pass holders. Staying here, we had a lift quite literally on our doorstep and a smattering of bars and shops within a five minute walk. What Chamrousse lacks in size, it makes up for in charming views and easy to ski, well-maintained pistes. It was our first trip without ski school and we found the gentle blue and red runs to be great confidence builders and largely empty even in January. Aside from the free pool/hot tub/sauna combo (which was surprisingly good), Chamrousse is pretty quiet. However we were smitten by the nearest bar – Doudou’s – which offered mulled wine and crepes for a ludicrous €1 in the evening. We also took an incredibly good candlelit snowshoeing tour that I’d thoroughly recommend. Tucked away at the head of the Zillertal valley in the Austrian Tyrol is the town of Mayrhofen. Better known to some as the home of Snowbombing festival, it’s a great choice all season long with fantastic skiing and a lively, party atmosphere. Although the snow has been drawing crowds here for decades, the legendary après scene also guarantees you’ll have as much fun off the pistes as on. The Zillertal valley is a huge ski area, so there’s plenty to explore whether you’re an experienced skier or boarder, or a complete beginner. I learned to ski here, and found the ski schools not only great value for money but also good at getting us out exploring whilst we found our ski legs. You won’t be stuck on a green run for long. Up on the mountain you’ll find lots of restaurants offering hearty and affordable food, as well as cold beers and hot chocolates as the afternoon wears on. The Schneekarhütte at the top of the Horberg offers something a bit more special and has fabulous views from its terrace. Just don’t fill up too much, there’s a challenging red run back down from here into the valley! At the end of a day on the mountain, the bars and restaurants at the top of Penken gondola are a great stopping point with good views of the pistes behind. Back in town is where the party starts. 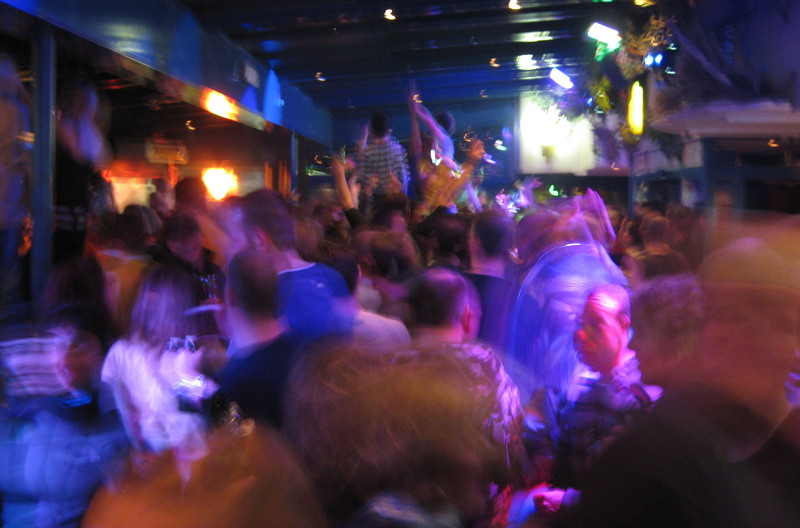 For cheap beers and the best crowds, Ice Bar (at the foot of the Penken Gondola) is where the crowds go. By 5pm you might not be able to get through the door, so stop off on your way home for a Europop party and some great Austrian hospitality. It’s early doors, so make the most of it – you’ll have to be out at 8pm. For later nights, there’s a huge variety of places to choose from along the pretty main street. Basement bars make a cosy spot for drinks and catching up with friends, and there are a couple of clubs if you fancy making it a late one. Our favourite evenings were spent in the Sports Lounge at the SportHotel Strass, where you’ll find live music most nights – and White Lounge. If there’s one thing you need to do in Mayrhofen, you need to go to the weekly party at White Lounge. 2,000m high on the Ahorn mountain, it’s a hotel and bar igloo complex, built from fresh snow each season. A gondola packed full of partygoers heads up the mountain early in the evening, to be greeted by a torch-lit procession. Flaming torch in hand, you’ll head to the igloos, where you’ll find a packed dancefloor, chillout rooms and the sort of fun that’ll have you dancing on tables before you know it. Yes it’s raucous, but it’s also one of the coolest things you can do on snow. Relatively unheard of compared to its more popular neighbour, Sauze d’Oulx (although if you fancy finding out if Sauze is all it’s cracked up to be, you can read my review in Skiing the Milky Way: The sun-drenched pistes of the French-Italian border), Bardonnechia ticked all the boxes for us as a group of moderately experienced skiers and boarders looking for somewhere with a bit of life to it. The ski area is big enough to keep you entertained all week, with a variety of pistes and some notably pretty tree-lined ones. We booked ski-in/ski-out accommodation at the Campo Smith apartments which made for a great base for the week. It’s a minute from the nearest lift and a less than a minute from our favourite après-bar, Cipo’s, notable for its retro taste in music (good) and free antipasti between 5pm and 6pm each evening (even better). The town itself is a little more unusual as most of the properties are owned by Torino families who visit on weekends and holidays, meaning it can feel pretty quiet much of the time. That said, we found a good selection of restaurants (serving authentic Italian food) and bars, although the supermarket was a little on the small side for adventurous self-caterers looking to dip into Italian cuisine. There’s also lots to keep you entertained when you’re not racing down slopes: We found great cafes on the mountain with the most incredibly delicious hot chocolate (our favourite was Birichini at the top of the Les Arnauds lift), and spent an afternoon snow-shoeing through the most beautiful countryside further up the valley. It’s also less than an hour by train from the town’s rail station to Turin city centre if you fancy exploring without skis strapped on. 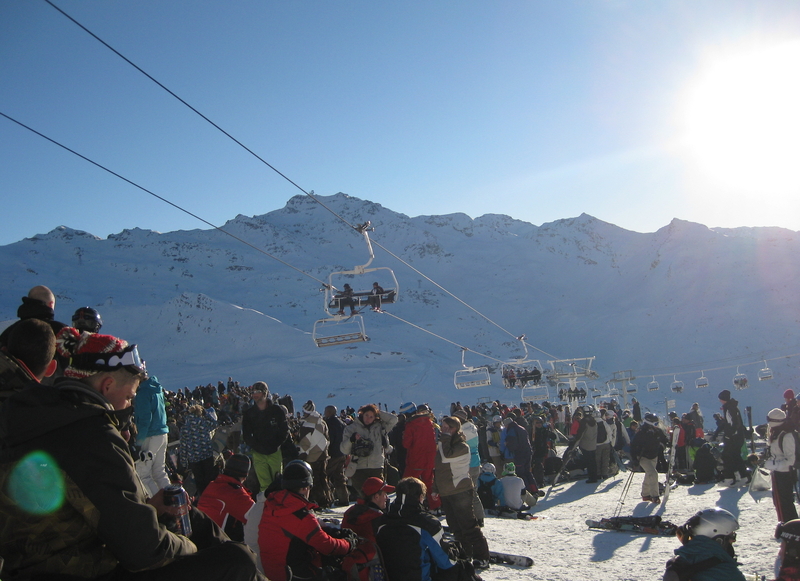 Val Thorens is the jewel in the crown of the Trois Vallées. 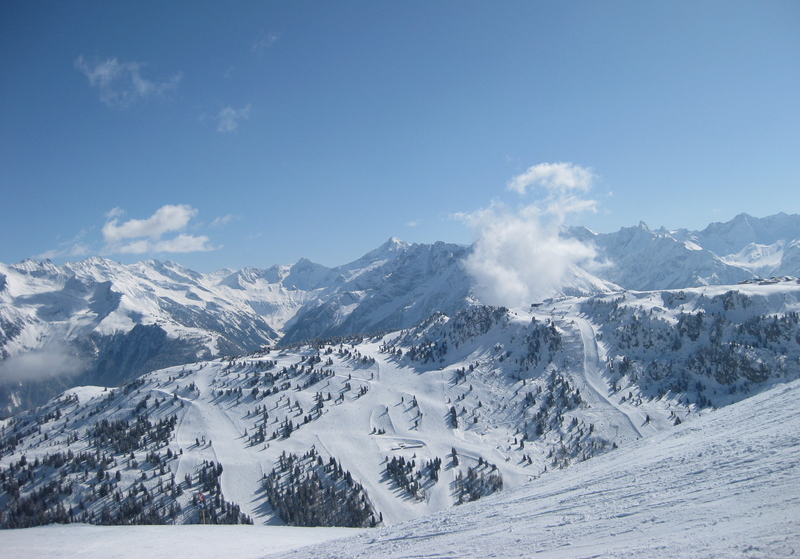 Perched at the top of this famous ski area, it’s the highest altitude resort in Europe. This means one very important thing – fabulous snow. Whether you’re hoping to ski early or late in the season, or just want to be confident you can make the most of every daylight hour on the pistes, this friendly, purpose-built town is the perfect base. You have access to a vast ski area – with Courchevel and Meribel accessible on piste for confident skiers and borders – and it’s diverse. The huge bowl shaped valley offers lots of gentle slopes perfect for beginners, whilst more experienced skiers can venture further afield or tackle more challenging reds and blacks close to home. It’s also a perfect sun trap – and a great spot to people watch from balconies overlooking the piste. We visited in January and were hugely impressed with the proportion of pistes that were open, and even as relative newbies could comfortably ski new ground every day. you’re done exploring for the day, head to the Folie Douce on the Plein Sud piste for some of the most outrageous après you’ll find in France. The party gets started around 3pm, with a live DJ every day and live music too if you’re lucky. Grab a beer, find a spot in the snow and enjoy one of the most surreal and fun experiences to be found with your skis on. And try and keep hold of you ski legs on the way back down – not everyone does! 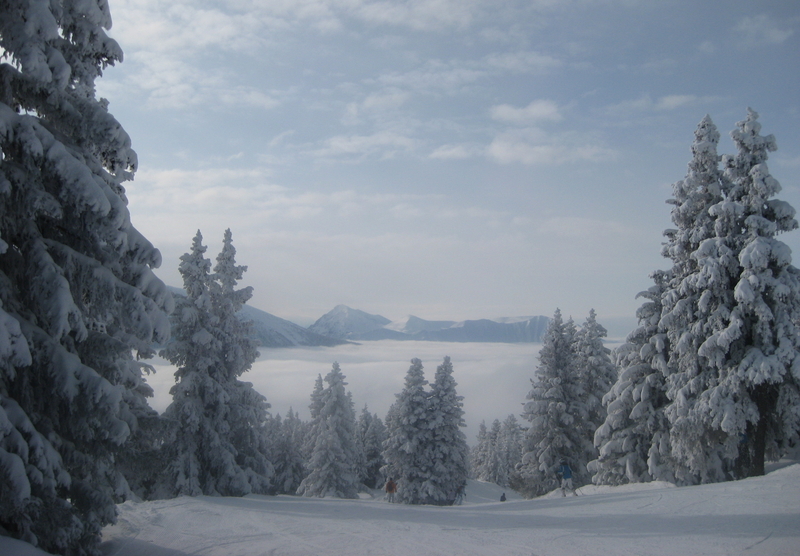 Feeling inspired by my ski travel guide? Or have your own off-the-beaten path suggestions for frolicking in the snow this winter? I’d love to hear your suggestions in the comments below.